Preheat the oven to 350 degrees. Oil a loaf pan or 6 muffin tin/ containers. Prepare the dry ingredients by sifting them into a large mixing bowl; the barley flour, baking soda, baking powder, salt, spices, and maple sugar. Add in the chopped walnuts if using. In another small bowl, combine all of the wet ingredients; the pumpkin, oil, grated ginger nut milk, and the vinegars. Mix the wet into the dry and pour into a well-oiled pan. Mix only until just incorporated- do not over mix. Sprinkle the maple sugar over the entire surface of the loaf and bake for 35 minutes. Rotate the pan and continue to bake for another 8-10 minutes. Let cool in the pan on a rack for 15 minutes and then remove the loaf entirely to the rack to let cool. Once cool, you can place it back into the loaf pan. *For the loaf, let it cool thoroughly before attempting to slice into it. 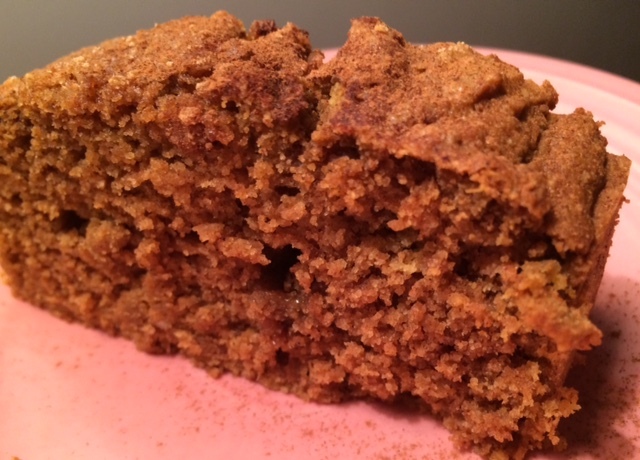 This entry was posted in breakfast foods, desserts and tagged fricken delicious, pumpkin, pumpkin spice bread, Simple Treats, wheat-free. Bookmark the permalink. I would use WW flour then over the chickpea flour- whole wheat has substance, gluten, that the chickpea flour has none of. Tell me how it comes out!